The elections to the opposition’s Coordinating Council sparked debates on the future of Russia's opposition. While some pundits see them as "virtual" and "far removed from reality," others argue it is an attempt to bolster real democracy in the country. Russia’s opposition leaders have held elections to its Coordinating Council (CC) – a single governing body that is intended not only to coordinate the protest movements, but also to represent angry citizens in their dialogue with the Kremlin and the State Duma. 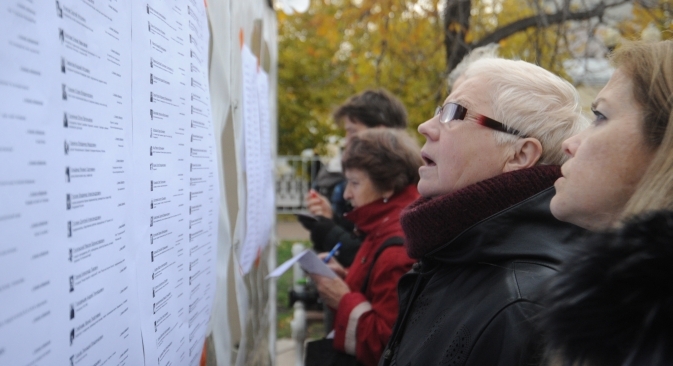 A week after the regional elections on Oct. 14, another round of voting has taken place outside of public administration: the election of members to the opposition’s Coordinating Council (CC). The purpose of the body is to develop a unified ideology, coordinate opposition activities, and represent dissatisfied citizens who have been involved in protests since the Duma elections of December 2011. According to Dmitry Oreshkin, the creation of the Coordinating Council was both inevitable and necessary. "The existence of the opposition’s Coordinating Council does not guarantee success, but its absence guarantees failure," Oreshkin added. Pavel Sheremet, a political commentator for Kommersant, agrees with Oreshkin on the underlying importance of this political development. The CC is set up as a body of 45 elected members. Thirty of these members are elected according to the so-called general civil list, under which anyone can run. In addition, there are five representatives from each of the three main ideological strata —the left, liberal, and nationalist regional organizations. The members of the body are elected to serve for one year. “This formula may not seem that straightforward, but it is the result of a broad compromise between very different political forces,” said CC elections organizers on the official website of the opposition’s Central Electoral Committee. Political scientist Mikhail Remizov has his doubts about the efficacy of the newly formed governing body. In total, more than 200 people were in the running for 45 seats. Among them were not only popular leaders of street protests, but also less-prominent businessmen, journalists, public activists and other interested citizens with political ambitions. Regardless of personalities, track records, and ideologies, Oreshkin believes that the most important task for opposition leaders is to focus on trust. According to Oreshkin, opposition leaders can only gain legitimacy – the kind “system politicians” lack – through elections that target audiences’ trust. The elections to the CC were initially scheduled for Oct. 20-21, to be held online and at specially sited ballot boxes. However, the opposition was unable to complete the procedure in time: the website of the Central Electoral Committee was attacked by hackers on Oct. 20, and voters were unable to cast their ballots online. As a result, voting was extended until evening the following day. The voting disturbance reveals the fact that authorities have already taken note of this opposition development, says Ocherkin. The elections were also hit by financial scandal. According to regulations, the main source of funds for the elections came in the form of a 10,000-ruble ($320) fee, which all registered candidates paid. However, shortly before the elections, some of the registrants accused the organizers of fraud and demanded their money back. Following an investigation of the alleged fraud, law-enforcement agencies launched criminal proceedings. Organizers of the opposition elections, meanwhile, announced that any candidate who requested a refund would receive their money back. Ocherkin believes the scandals are overrated, however. As would be expected, not everyone sees eye-to-eye on the significance of the opposition’s new governing body and the elections that it held. Nikolai Levichev, chairman of the opposition party “A Just Russia,” believes that the elections are an exclusively online project. Ocherkin suggests that the significance is much bigger. Kremlin authorities, for their part, are restrained in their official comments regarding the CC’s future. “We don’t yet understand what kind of structure it is, who the members are, what sort of people they are. Therefore, we can’t comment,” presidential press secretary Dmitri Peskov told Kommersant Vlast. President Putin, however, has already repeatedly stated that he is ready to meet with them. Material based on articles published by Kommersant and Kommersant Vlast, RBC Daily, RIA Novosti, and Gazeta.ru.